Many of President Obama's critics have pushed a false narrative that President Obama didn't accomplish much in his eight years in office completely ignoring what the man had done and the obstruction he faced. Well Michael I. 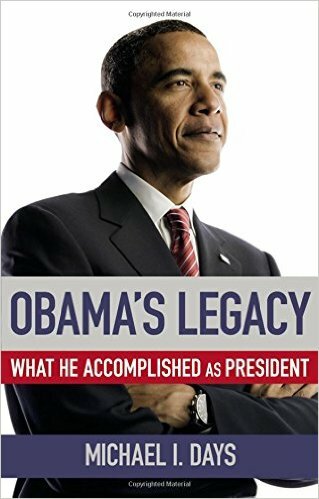 Days has written a book, Obama's Legacy: What He Accomplished as President based on FACTS that looks at President Obama's legacy. Evidence indicates President Barack Obama has been tremendously successful and effective by objective measures. On economic indicators alone, he is credited with the longest streak of job growth in U.S. history, a two-thirds reduction in the federal budget deficit, and the rebounding of the stock market to record highs following the record lows of the recession under his predecessor. His victories have come against a backdrop of criticism and sometimes open defiance from conservatives, lack of cooperation in Congress, and racially tinged commentary in traditional and social media. Through it all, the President who campaigned on a slogan of 'Yes, We Can!' has persevered in his determination to make a difference and left an indelible mark on American politics and the world. LEGACY is a commemoration of his eight years in the White House.